Cast: Jake Gyllenhaal, Rene Russo, Riz Ahmed, Bill Paxton, Kevin Rahm. Synopsis: A man desperately seeking work finds himself a unique opportunity to get into the world of LA crime journalism, as he gets more and more into it, he ventures into a dark and dangerous world of crime. Review: The news, something that many of us pay a very close attention to, and has a deep impact on many lives across the globe. Every day, we see stories from across the globe that trigger reactions in all of us. Crime stories in particular often have the most impact on people as they usually take deep root, particularly when innocent victims are attacked and struck down in what may seem unprovoked assaults. As it is told in the movie “think of our newscast as a screaming woman running down the streets with her throat cut.” The media thrives on these sorts of stories, and in particular the TV news plays its part in bringing these stories to life, especially through TV news. In the city of Los Angeles, one man happens to find his calling. Lou Bloom is a dark and twisted individual, portrayed excellently by Jake Gyllenhaal. This man possesses an incredible personality and an insatiable desire to achieve great things. When he stumbles upon an accident and finds someone filming it for TV news for profit, he finds what he knows he was born to do. 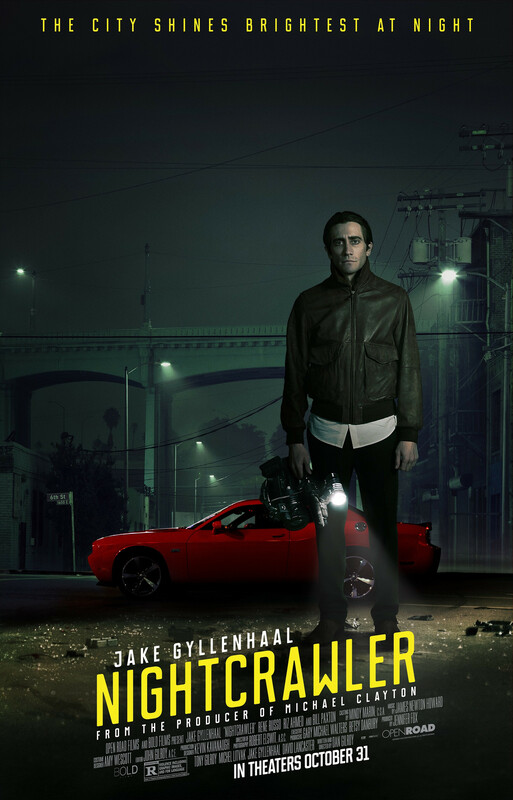 Thus he sets out to become a “nightcrawler” and develops a strong ability for this unique career, to the point where he gets too good it at it, so much so that he meddles in criminal activity to get the perfect shot, or sabotage his rivals so it is his shot that gets the news studio’s approval and thus he can get the big story on the TV news and earn that big pay cheque to go with it. Through his pursuits, he develops a grand ego and spectacular self-delusion, he hires an assistant (Riz Ahmed) and immediately, there is talk of him and his company and his ego just gets bigger and bigger. Through all of his arrogance, you want to hate him, but you really just cannot bring yourself to do so. Through his extreme of confidence, he doesn’t hold back in demanding what he wants, even though in some cases he cannot have it, and in that, there is almost a desire to root for him as he goes from once crime scene to the next. Yet at many points he turns into a dangerous psychopath that you probably should not root for. Enter Rene Russo as TV boss Nina, who’s out looking for any footage she can to splash all over the TV news that day. When he has what she needs, he senses an opportunity to either get a pay rise or make sexual advances on her and will seek to do anything he can to get that ultimate goal that he desires, to be the best man in his field. His exploits do not make you like him, or the way he treats people particularly Nina, but yet his confidence and sheer self-ambition ensure your interest in him does not waiver and despite his blunt walk of talking to people and his extreme self-confidence, he keeps you interested. Through his various screenwriter endeavours, writer/director Dan Gilroy in his directorial debut, brings us a dramatic character driven story with a fantastic script that bagged him an Oscar nomination for original screenplay and a well-deserved one at that. The streets of LA are looking vibrant and bright as well as they since 2011’s Drive came along. He handles the intense action scenes very well, it is riveting and pulsating cinema that just keeps the audience engaged and reminds them what it is like to view a film, in a cinema in all of its dazzling glory. What is more, it reminds you that despite the dominance of superhero movies, young adult novels and reboots and continuation of many a popular franchise that mesmerising, unique and outstanding stories are still being brought to the big screen. Though it only scooped the one Oscar nod, it arguably could and should have another for Gyllenhaal’s outstanding performance, nevertheless despite its significant lack of award nominations, it has much to say for itself. A magnetic screenplay with terrific acting and exquisite directing, watching the news will never quite be the same again. With a brilliant screenplay, terrific performances with a career best from Gyllenhaal, this is a visually explosive thriller that ensures the news will never be seen in quite the same light again. Excellent review. I have to get this under my belt. It sounds right up my street, especially if the street look as they did in Drive, as you point out. Loved this. Would love your take on mine too. I was far more annoyed that it didn’t get more Oscar recognition.